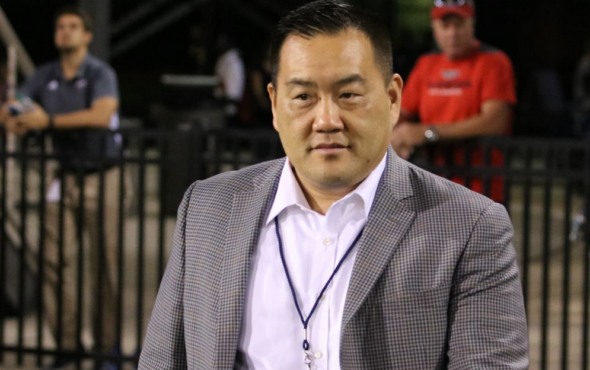 To replace Bill Moos as AD, Washington State hired Patrick Chun of Florida Atlantic, where had a reputation as a good fundraiser and hired Lane Kiffin, who went 11-3. The man who a year ago hired the eccentric Lane Kiffin will now be in charge of Mike Leach, who made eccentricity fashionable again in college football. Patrick Chun, athletics director at Florida Atlantic University in Boca Raton, an FBS member school for just 13 years but coming off an 11-3 season that included a bowl win, will be announced at 11 a.m. Wednesday as Washington State University’s new athletics director, succeeding Bill Moos. The news was first reported by ESPN. Chun is known as an aggressive fundraiser, a major virtue in the eyes of Kirk Schulz, hired 18 months ago as WSU president. Schulz was dismayed to see Cougars athletics run up a $51.6 million deficit after annual losses in six consecutive years, thanks to facilities build-outs under Moos in the NCAA arms race. The Cougars’ $12.9 million deficit in 2016 ranked second only to Cal ($21.7 million) out of more than 200 Division I public schools in deficit size, according to data compiled by USA TODAY Sports. Chun, a native of Strongsville, OH., worked at his alma mater, Ohio State, for 15 years before taking in 2012 the AD job at FAU. In December 2015, he pulled in $16 million, the single largest gift in FAU, from a foundation to help fund construction of a new campus football facility. One of Chun’s final moves at FAU was to extend to 2027 the contract of Kiffin, the much-traveled coach who had been all but fired by Alabama coach Nick Saban in December 2016. After three consecutive 3-9 seasons, Chun hired Kiffin, 42, and found immediate results, winning the Conference USA championship followed by a 50-3 win over Akron last month in the Cheribundi Tart Cherry Boca Raton Bowl (not making up that name). Kiffin in 2011 infamously was fired on the tarmac at LAX five games into his fourth season as head coach at USC, where he worked under Seahawks coach Pete Carroll from 2001-06. But Kiffin as offensive coordinator helped Alabama win a national title in 2015, then in 2016 helped the Crimson Tide put 52 points on USC in a big win. Kiffin in 2017 coached the Owls to the best season in the school’s big-time history. Now his boss is off to Pullman, where Leach was signed to a contract extension after his third eight-plus win season in a row. Chun replaces Moos, who left abruptly to take the AD job at Nebraska three months ago after a falling-out with Schulz over issues including the deficit and fund-raising. Ah, Wazzu. Always a stepping stone. Never a destination point. He will be gone in 5 years.